The position of a bed can affect the occupant. We’ll look at how the structure and layout in the bedroom influence us and the quality of our sleep. Note: To get a jump-start on the lesson, please read pages 102-105 in Interior Design with Feng Shui. Because we spend about one-third of our lives in bed, the shape and location of the bedroom — as well as the shape and position of the bed — affect us. Read on and find out how you might get a better night’s sleep and be more effective during the day. Years ago, Master Lin Yun took me to visit the home of a doctor. This Western-educated doctor lived in a Hong Kong skyscraper and suffered from insomnia. On examining the bedroom, Lin Yun commented that while in bed, the doctor was exposed to strong currents of ch’i crossing over his bed from one window to another. The ch’i was intensified by the fact that a freeway was aimed at the high-rise and then veered away, further sending the strong ch’i of Hong Kong’s chaotic traffic in his direction. Years later, when I was visiting the apartment of a young, childless couple, I noted that the bed was between not two windows, but a window and the door to the bedroom. When I noted that the flow of ch’i crossed the bed around the occupant’s abdomen, the wife confided that she had trouble conceiving a child. Doctors told her that she needed an operation to solve her fertility problems. In both cases, the cure was to install a crystal, wind chime, or mobile in between the windows, or the window and door, to help disperse the strong flow of ch’i. After the doctor cured his bedroom, Master Lin Yun’s solution worked like a gentle sleeping pill. After the previously childless couple cured their bedroom, the wife had a successful operation; they later conceived a child and enjoyed a healthy birth. Bed position affects the flow of ch’i. If you bed cannot be located diagonally across from the door, you can cure this by hanging a mirror that lets you see — from the vantage point of your pillow — the bedroom entrance and therefore anyone entering your bedroom. If a window sits where the mirror should go, merely position a cheval mirror angled to reflect the bedroom door. College life for me was pretty miserable what with normal academic pressures, a terminally ill parent, and unwanted amorous attention from psychotic students and married professors, not to mention a thieving roommate. Was it any wonder I ended up with mononucleosis? (I’m not kidding.) Granted, one never knows what life or fate will dole out, but it seemed that if life was a bowl of cherries, I was definitely getting the pits. Would college life have been more positive if my room’s feng shui was better? Maybe, maybe not! When I first observed in Hong Kong how, according to feng shui, a bed could best be positioned in a bedroom, it all made a great deal of sense. And, I might add, that life in general became more of a positive adventure. Enough of a confessional . . . In feng shui, the optimal position of your bed is cater-corner to the bedroom door. This diagonal-to-the-door bed placement is called the “commanding position” because when you are lying in bed, you will have the widest possible view of the bedroom. The commanding position puts you in an advantageous spot to be aware of what is happening. For instance, you can see anyone entering — you won’t be startled and will feel more in control. The commanding bed position therefore promotes smooth, balanced ch’i flow so you will sleep better and perform better professionally and in life. If, however, your bed doesn’t or cannot be situated in the commanding position, you may feel edgy and be uncomfortable and it will affect you ch’i and make you jumpy and nervous. Sleeping without the commanding view of your bedroom may affect your personal relationships and performance at work. And if your ch’i is unbalanced, you may suffer from health and personality problems. Particularly bad is the “mortuary bed position.” This is when the foot of the bed aims directly at the door. This position reminds the Chinese of a coffin or body being interred in a mortuary waiting to be buried; they say this bed position is reminiscent of a corpse that is taken to the gravesite feet first. Not surprisingly, this bed placement evokes foreboding of death. If your bed lies in the mortuary position, hang a crystal ball or a wind chime between the foot of the bed and the door to alleviate the negative effects. The Chinese say that the shape can affect us. One film director in Hong Kong traded in his king-size bed for one with rounded corners to take the edges out of this troubled marriage. An American journalist living in Asia was advised to exchange his twin mattresses for a king-sized one to bridge the gap in his relationship with his wife. 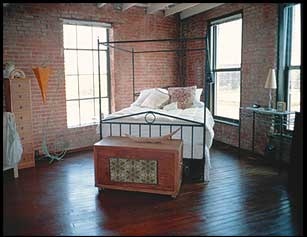 And platform beds are fine — as long as you are not trying to have children (see Feng Shui Design, pages 169-170). In general, beds should rest against a wall and have headboards to give its occupants a comfortable feeling of support, stability, and security. A solid headboard is preferable to one with slats. Solid headboards provide more support and stability; they will make you feel more secure in life and restful in bed. Slatted headboards, be they wooden or cast iron, are better than no headboard, but less secure than a solid one. The scale and shape of what is next to the bed can also affect you. For instance, if the side or foot of your bed lies too close to a large, heavy armoire or dresser, your ch’i can become unbalanced, your physical movements will be inhibited, and your internal harmony upset. You should avoid having heavy furniture anywhere near your children’s beds, as children tend to be more affected. I’ve seen many such furniture arrangements in children’s rooms, and many of the children have suffered broken arms. Pages 160-173 in Feng Shui Design go over bed placement in more detail and provide diagrams of bed placement to refer to. You can soften the sharp angle of a corner by obscuring it with a plant — even training a vine to grow up it — or hanging a crystal ball in front of it. You might install a mirror up to the edge of one side of the corner to make it appear to disappear, or hire a builder to round out the corner. By now, you should be getting the gist of how feng shui cures work. The structure within your bedroom can also affect you. For instance, corners that jut into the room can be threatening to you, foreboding assault, or they can symbolize fingers pointing and accusing you. Beams in your bedroom can also be problematic, and rafters, while charming and rustic to the Western eye, mean trouble to the Chinese. This is not just superstition, as load-bearing beams can create a feeling of compression when we are beneath them. In feng shui terms, low-lying beams and rafters are burdens to prosperity and growth. They are seen to oppress the ch’i of those beneath them as well as impede ch’i circulation throughout the house. The harm caused by a beam in a bedroom varies with its position. For example, a rafter over the head of a bed may cause migraines or constant headaches. A beam above your stomach may cause ulcers, backaches, and indigestion. A rafter over the foot of your bed will make you less mobile and unable to travel or act on issues. If the beam runs lengthwise down the middle of your bed from head to foot, this may be divisive to you and your companion if you are part of a couple. Years ago, when I saw a beam running down the middle of the bed in a newlywed couple’s home, I commented about the beam’s divisiveness. The wife replied that maybe that was why she always left the bed in the middle of the night to sleep somewhere else. A beam running down the center of a single bed can cause personality disorders. You can cure the beam problem in a number of ways. You can move the bed out from under the beam. You can install an overhead mirror to allow ch’i to penetrate up through the beam. Or you can place a fake firecracker above the beam to symbolically break through the oppressive structure. There are other cures listed in Feng Shui Design, on page 117, and in Interior Design with Feng Shui, on pages 93-95. Is your bed well placed? Do you enjoy optimum comfort afforded by a solid headboard? Do you have heavy objects or furniture nearby? How do they affect you? If any of these things displease you, what changes can you make immediately to change them? What changes would you make over the long term? Up until just now, I had never once heard about jutting corners in the bedroom and how they can symbolize fingers pointing and accusing you. I have a corner like that in my bedroom that points right at my bed, and for quite some time, & for no apparent reason,I’ve been experiencing the constant feeling of being under false allegation. Needless to say, I was floored when I read that! I’ll be finding something to hang in front of it ASAP. Thanks for the advice!! !